Review quiz! 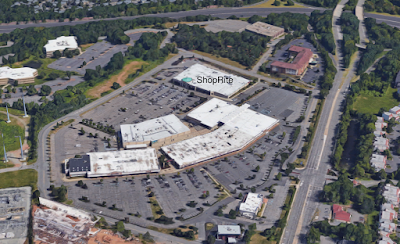 What Wakefern member owns the ShopRite of Garwood? If you answered Village Super Market, ding ding ding! You've got it. We took a look at Garwood back in December, and we're going to take a tour of a very similar store today. 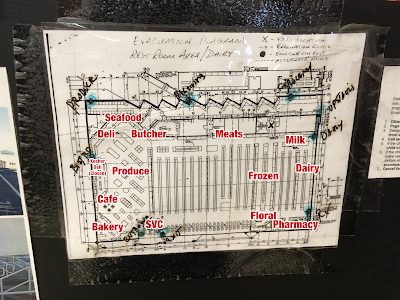 The West Orange ShopRite was built in 1994 on the site of a former Pantry Pride in the Essex Green Mall, a midsize shopping center in a suburban neighborhood. Image from Google Maps. The ShopRite is on the lower level of the plaza, so it's practically invisible from Prospect Ave (the major road at right). However, when there aren't many leaves on the trees, you can see the ShopRite sign from Route 280, the highway across the top. Like Garwood, Essex Green was built with the checkerboard decor seen in Elizabeth, and has also been renovated at least once. At almost 70,000 square feet, it's a huge store, and like Garwood, it has been significantly improved in recent years, even months. The sign on Prospect Ave has the rounded version of the new ShopRite logo. Until very recently, the sign still had the pre-2002 logo. Storefront looking great! Again, both the circular logo and the ShopRite lettering to the right have been replaced recently, and the entire facade was repainted not long ago. Like Garwood, this store has very high ceilings in the grand aisle. But unlike Garwood, the high exposed ceiling continues across the entire store. The store is very spacious. All the produce cases are brand-new. Management offices are above the customer service counter, visible to the right here. Blurry picture of the prepared foods area looking up towards the bakery in the front. 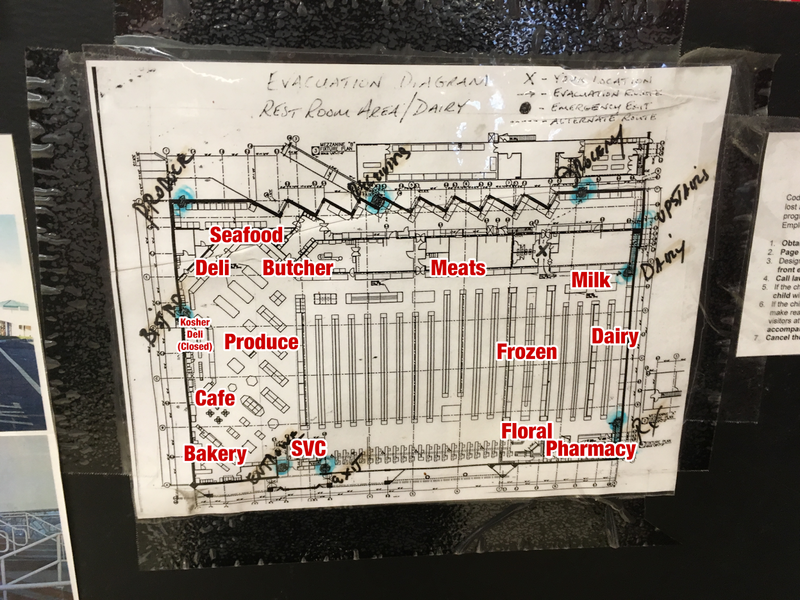 Produce is generally on the grocery side of the grand aisle, and the perimeter is other fresh products and service departments. This store has a sandwich counter, sushi, hot food, a salad bar, and an olive bar. The self-service food bars were recently redone. I've eaten lunch and dinner here, and the food is actually very good! The kind of blank wall used to have a larger Bistro Street graphic that matched the rest of the signs around. We talked about Bistro Street in the Garwood post as well. Bakery in the front corner, with all-new cases as well. Large cheese selection in the cases in front of the deli. This is one of the few ShopRites that sells Boar's Head products. I'm a big fan of the deluxe, 3-D wall graphics. In fact, I think they're better than what a lot of stores are doing now, even though they're about ten years old. Decent seafood counter in the corner, then butcher next. Packaged meats continue along the back wall. Contrary to what the signage would have you think, the butcher counter is actually under the circular Meat sign, not the Meat Service sign! All new produce cases here too. I also like the way the X pattern between the decor elements reflects both the pattern on the storefront and the ceiling design. Standard grocery aisles, a lot like Garwood. This store used to have a lot more junk cluttering up the aisles than it does now. Meat section along the back wall with coffin cases of more meat in the center. The freezer aisles are down at the far end of the store. Like many stores of this era, it was originally a double-wide aisle with coffin cases running down the middle. Over time, the owners replaced the center freezer cases with upright but not the two sides, so the center (black) cases are newer than the outside (silver) cases. With 20 aisles in total, Essex Green is a huge store. Milk is in the far back corner. Dairy then continues along the last aisle. It's a little confusing, but you're looking at the side wall in the photo above. The back wall is to your left. More great 3-D wall graphics in the last aisle. I swear Essex Green used to have 22 aisles. Can anyone back me up on that? Am I going crazy? Newly upgraded pharmacy in the front aisle, with floral next along the front end. Essex Green's sales volume is clearly through the roof. Why else would they have almost 30 registers? Again we see the repetition of the X pattern, this time over the checkouts. And here we see the nine express registers and customer service. Don't ask me what a 1980s ShopRite slogan is doing in this store, built '94 and renovated ca. '07! Essex Green is huge and feels huge, and it's a very nice store. It's been drastically improved over the years and is now one of the better supermarkets around.